McGulpin Point is now listed on the official “Light List” that is maintained by the U.S. Department of Homeland Security and the U.S. Coast Guard. The listing marks the first time the lighthouse has been included since it was decommissioned in 1906. 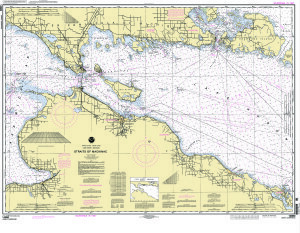 The light has also been added to the 2010 printing of the NOAA chart of The Straits of Mackinac. Emmet County is proud to receive this formal recognition and to provide this navigational service to the boaters of the Straits. McGulpin Point is listing number 12651, with the coordinates of 45-47-13. 128N.